Hi, I'm Adam. I’m a design strategist dedicated to helping organizations and leaders build new businesses, capabilities, and competencies through human-centered design and design-led innovation. I’m deeply passionate about creating exceptional experiences that inspire positive change. I started my career in a small industrial design studio sketching and 3D modeling concept directions for a range of products from ceramic tableware to headphones and Bluetooth speakers. My curiosity to understand how products fit into the larger context of the business led me to Fahrenheit 212 in New York where I was part in a multi-disciplinary team that married business rigor with consumer insight. At Fahrenheit 212, I developed and brought to life new products, brands, and services across all relevant touch points, be it print, packaging, digital, 3D models, and customer experiences. After Fahrenheit 212, I joined Doblin Group in London, United Kingdom, a part of Deloitte Consulting where I was able to immerse myself into the world of design-led innovation. As Doblin’s first hire after the Deloitte acquisition and the 3rd team member in London, I was brought in to help grow a multidisciplinary practice of researchers, designers, and strategists to expand the firm’s global footprint across EMEA. I contributed to the growth and development of the practice by establishing business development collaborations inside Deloitte’s c-suite network, provided thought leadership as well as innovation training to colleagues, and led various operational and recruitment functions as the team grew from 3 to 15. 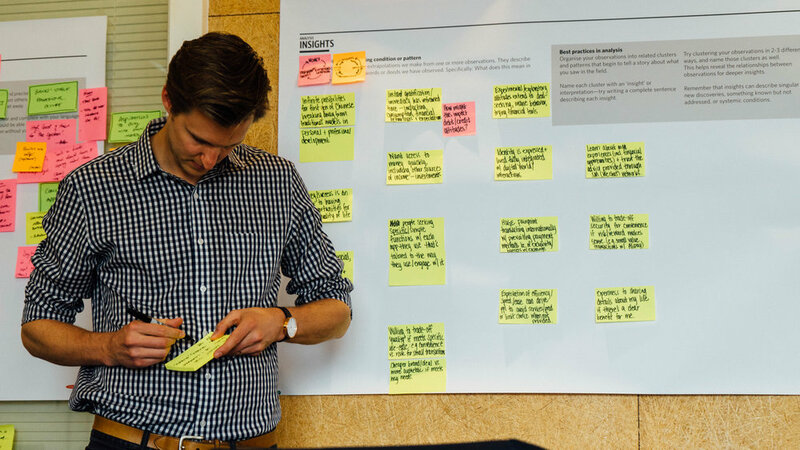 As a Design Strategy Lead at Doblin, I led project and client teams through a human-centered design approach by moving from insight and opportunity to the development and implementation of viable new businesses that met real consumer needs. My work was fueled by the requirement to move from deep customer insight to prototyping and storytelling—iteratively testing and refining concepts to ensure feasibility, viability, and desirability. During my time at Doblin, I had the pleasure to be part of project teams that built a virtual bank for people at the base of the pyramid in Sub-Saharan Africa, helped an agriculture business in India support rural farmers, built a secondhand stroller business for millennial mums, and helped a CEO and his 35 senior executives of a global financial services firm develop the collective capabilities to lead through the digital age. My work has led me all over the globe to the US, Europe, India, China, and Africa. These experiences have played a significant role in expanding my worldview and embedded a deep empathy, which serves as the foundation for meeting human needs and is the basis for designing solutions that are relevant to the end user. As a designer, I feel blessed to have the opportunity to create solutions that improve people’s lives, helping them realize their hopes, dreams, and ambitions. The video above about design research in Sub-Saharan Africa was produced while I was at Doblin in 2016. After moving back stateside to New York, I joined the high growth mattress start-up Casper, to instill a human centered design capability across Digital, Environment, and Creative teams—helping the business grow the core, unlock new categories, and reinvent sleep. As the first Design Strategist in the New York office, I led the development of a range of digital, omnichannel, and experience propositions by moving from insight to implementation at a blazingly fast speed by deploying "design thinking" and "design strategy" methodologies across the business. In 2017, I joined the prestigious consulting firm, McKinsey & Company. I help organizations across private, public, and social sectors harness design as a tool for leadership, performance, and innovation. Responsible for leading human-centered design to help clients surface new insight, create exceptional experiences, and drive organizational change. Interested in collaborating? Feel free to get in touch!